A friend of mine was telling me about an article he read recently describing the health benefits of drinking aloe vera juice, particularly in aiding digestive issues. When we think of aloe vera, we usually think about using it to treat minor cuts, scrapes and burns- not cleansing our colons. Drinking aloe vera juice regularly helps repair damaged gut tissues and gently breaks down and washes out unabsorbed food particles in our colons. As an anti-inflammatory agent, aloe vera soothes digestive tract irritations, ulcers, colitis and acid reflux. It also encourages the release of pepsin, a gastric enzyme which degrades food proteins into amino acids. 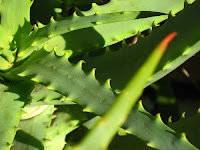 Although the initial phase of drinking aloe vera juice may cause diarrhea or stomach cramps during the "cleansing process" as toxins and build-up are removed, symptoms typically go away within a few days followed by increased intestinal function and relief from whatever was troubling you to begin with. So if you are suffering from irritable bowel symptom (IBS), heartburn, constipation, ulcers, or any other digestive issue, it's worth trying out aloe vera juice!